On April 28th prof.dr.ing. 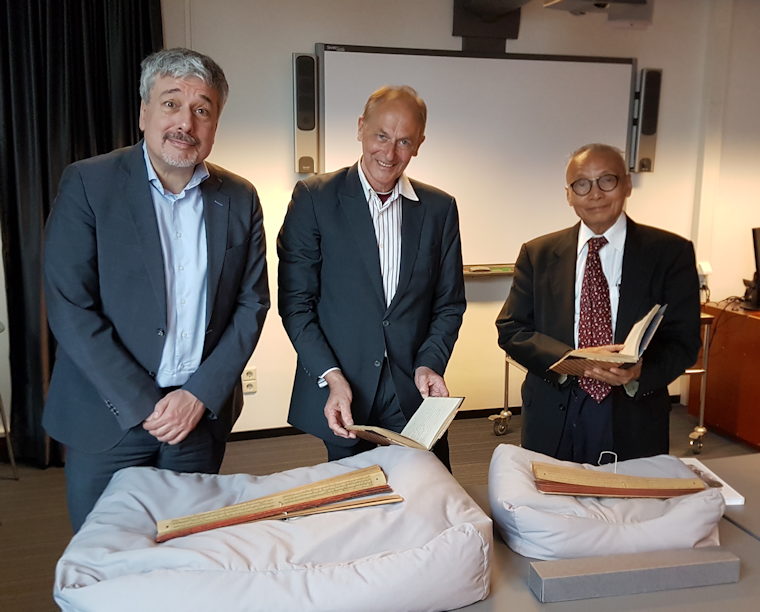 Wardiman Djojonegoro, former minister of Education of Indonesia, visited dhr Kurt De Belder MA MLIS, director of UB Leiden and dhr Roger Tol of KITLV concerning the project: “Panji tales manuscripts”. 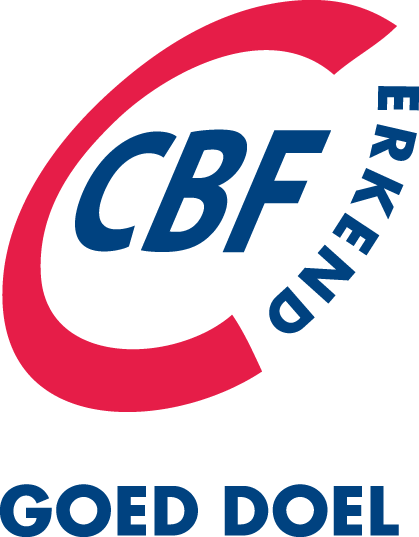 This visit was made possible by mediation of The Corts Foundation. Perpustakaan Nasional Republik Indonesia (PNRI), the National Library of Indonesia, is researching at the moment, together with several institutions in countries in Asia, the University Library of Leiden and The Corts Foundation the possibility of an application of the “Panji tales manuscripts” to the World Memory Register of UNESCO. 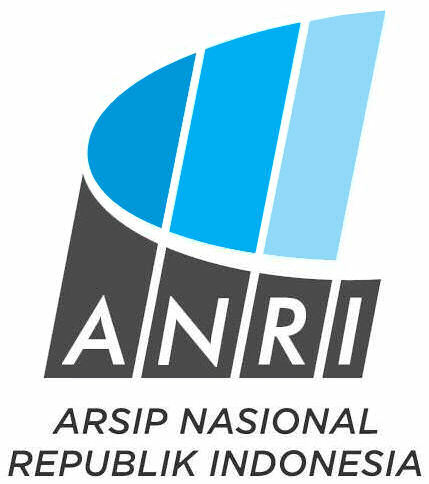 The website of Sejarah Nusantara that is developed by The Corts Foundation and ANRI together to publish parts of the VOC archives contains thousands of scans, digitized archive series, databases that are fully searchable and connect to documents and scans, embedded book publications and scientific articles. Most sources are connected with eachother and can be browsed and filtered. To show these relationships, the numbers of scans and records, an infograph was created by Marco Roling of The Corts Foundation. The full size infograph is clickable to immediately go to the specific pages of the website that was created in the DASA project. 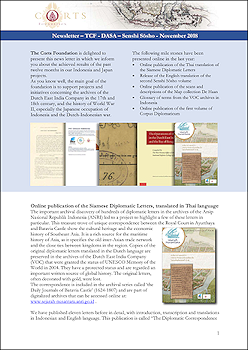 The Corts Foundation, in collaboration with the Arsip Nasional Republic Indonesia and Leiden University, has finally published 8,568 diplomatic letters to and from Batavia Castle from the 17th and 18th century on the website of Sejarah Nusantara. 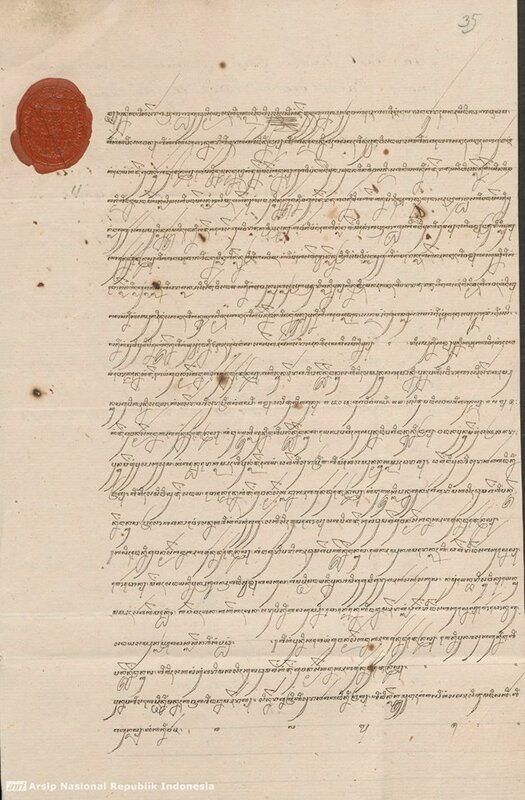 These letters were found in the archive series of Daily Journals of Batavia Castle (inv.nr. 2495-2623), and an additional series 'Incoming and Outgoing Missives from Indigenous rulers' (inv.nr. 3567-3593). A database was created to provide access to an index to letters that were send to and from Batavia. Also all the letters were mapped geographically and visualized in charts and maps. Additionally scans were made to complete the archive inventory numbers that contain diplomatic letters. For the first time we display a so far hidden collection of letters from mainly Indonesian sultans and radja’s. In fact, this is the biggest collection of archival materials originating from Indonesian rulers, only discovered in 2013 and a true historian's treasure. Dr. Hendrik E. Niemeijer received a personal invitation from the Rector of Universitas Diponegoro, Prof. Dr. Yos Johan Utama, to attend the 58 Dies Natalis celebration on 15th October and receive a special Award for his contributions to the development of the Maritime & Global History curriculum at the Faculty of Humanities (FIB). After speeches by the Rector and the Minister of Home Affairs the tokens were distributed. Dr. Niemeijer would like to share this Award with all the colleagues in the Department of History and thank them for their warm support and hospitality. 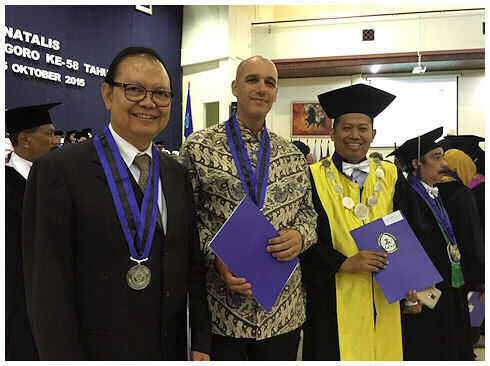 On the photo Dr. Niemeijer stands next to other award winners, Bapak Sigit Pramono Ketua Perhimpunan Bank-bank Nasional (Perbanas, the Chairman of the Indonesian Banks Association) and the Dean of the Faculty of Law.